Nachos are probably our single favorite snack in the world, which is why it’s so amazing that it’s International Day of the Nacho on October 21! 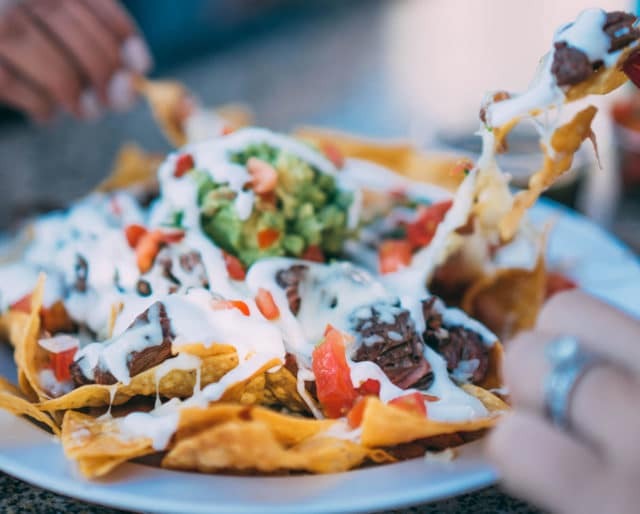 While many of us may think of nachos as having sprung straight from the mind of our eternal creator, fully formed, at some point millennia ago, at the dawning of time, the truth is that they’re a 20th century dish with a very real history and lifeline. It turns out, for example, that nacho cheese wasn’t even invented until the 1970s, which means the flower children of the 1960s somehow managed to go to Woodstock without so much as a hot Tex-Mex snack to keep them going! What courage. What fortitude. No matter. NACHOS ARE HERE TO STAY! This is going to surprise you, but we think the best way of celebrating International Day of the Nacho is to eat some nachos. Make sure you find the best nachos in your city, or if you’re living somewhere where they’re less easily found, then this is the ideal opportunity to make your own steaming pile of delicious nachos, and to educate your friends. You know what’s tragic? A person eating a plate of nachos by herself or himself is tragic. That’s why International Day of the Nacho is the perfect opportunity to socialize, and hey, who doesn’t love a message inviting them somewhere to consume a deliciously carb-y, fatty, greasy, hot, delicious snack? Nobody. That’s who. In honor of the creativity of Ignacio Anaya, why not create some nacho art of your own with tortilla chips and a blank canvas. Doing a quick search for “nacho art” on the Internet should give you ample inspiration. For example, there’s a guy who has changed the album covers of classic records to feature nachos. Bob Dylan’s “Highway 61 Nachos." Guns’N’Roses “Appetite for Nachos." You get the idea. And we’re not suggesting it would be going too far to get one of these tattooed on you today, either. In fact you should do that. Go out and get a nacho tattoo. Ignacio Anaya invented nachos by accident when some hungry customers needed feeding at his border town restaurant in Piedras Negras, Mexico. Lacking a chef for the night, he cut some tortillas into triangles, melted cheese together with the triangular chips, and topped it with jalapenos. Nicknamed “nacho” because of his small stature, Anaya called the dish “Nacho’s Special Dish," or “Nachos Especiales," and a dish was born. Nachos may have been invented on the border of America and Mexico, but they’re popular all over the world with their own special twists. In Memphis, Tennessee, for example, pulled pork is a common addition, along with barbecue sauce and peppers, while in Hawaii, kalua pork and pineapple nachos are very common. It’s the little variations in this delicious dish that make it so splendid. Traditional Mexican cooking is of course, delicious, but there’s something charmingly commercial and a little vulgar, yes, about the fusion of American tastes with Mexican cooking, first named after the Texas Mexican Railway chartered in Southern Texas in 1875. Nowadays, Tex-Mex cooking has spread across the world, with the first Tex-Mex restaurant opening in Paris in the 1980s. Basically, if there’s spice, tortillas, some fried protein and a chilli or two involved, we’re there. And we can celebrate the more traditional food another day!